In the wake of the recent Orlando shootings, a Pink Triangle, brightening up the Twin Peaks in clear view of the Castro district and downtown San Francisco, took on a special meaning Saturday. More than 300 volunteers – a record turnout, organizers said – helped set up the one-acre installation, which reminds people of “what can happen when hatred and bigotry are allowed to become law.” Although the Pink Triangle honors homosexuals who were persecuted in Nazi Germany, the 49 people killed and 53 injured at a gay nightclub, Pulse, on June 12 shared the spotlight Saturday. The Pink Triangle represents a “very sad part of gay history,” said Patrick Carney, the event’s founder. “We try to remember the hatred of the past, but we also try to illustrate that we are not out of the woods yet as Orlando so vividly illustrates,” he said. The mood in the Castro District was festive Friday as SF Pride kicked off with the Trans March. It was tense earlier in the evening, though, when politicians were booed off the stage in Dolores Park. Jean Elle reports. 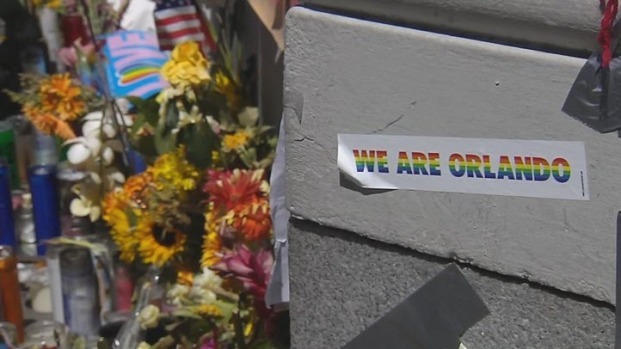 Although San Francisco Pride begins with a somber note Saturday, the bloodshed in Orlando shows that people “have to be more vigilant than ever,” Carney said. Carney stressed that the Pink Triangle is a way to raise awareness about discrimination meted out not only to homosexuals, but also Latinos and other minority communities. 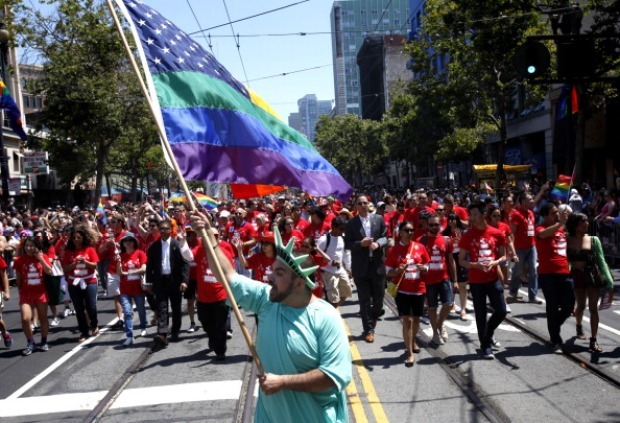 Hundreds of thousands of people are expected to pour into San Francisco for the Pride Parade. But in the wake of the deadly shootings in Orlando, this year's festival is taking a different tone. Christie Smith reports. Pride festivities kicked off Friday with the Trans March, which attracted a large crowd. The tone turned sour, however, when city and state leaders took the mic at Dolores Park to talk about legislative support for the community. Leno was booed off the stage and security personnel hurried Mayor Ed Lee to his car. With hundreds of thousands of people pouring into San Francisco for Pride festivities, the San Francisco Department of Public Health advised people Friday to get vaccinated after the State Department of Health announced an outbreak of meningococcal disease. Security has been beefed up for the weekend and San Francisco Police Department Deputy Chief Michael Redmond said plain-clothes officers will be stationed at all venues and Pride-related events. Black Lives Matter Bay Area organizers on Friday said they were withdrawing as Grand Marshals for Sunday's Pride Parade in response to the increased police presence and security measures. Several security check points have been set up around Civic Center Plaza, police said. Large bags and purses are banned and everyone will have to walk through a metal detector to enter the festival. The city said there are no known threats to Pride weekend. Officials are asking eveyrone who will be in the city this weekend to sign up for emergency alerts by texting "alertsf" to 888-777. A week after the deadly Orlando attack, San Francisco is preparing to host one of the largest Pride events in the country. Michelle Roberts reports. The Dyke March starts at 6 p.m. Saturday 18th and Dolores streets. For more information on the Pride Parade and street closures, visit SFPride.org. NBC Bay Area's Michelle Roberts and Bay City News contributed to this report.